Shin splints, or pain along the bone on the front of the shin, are also quite common causes of leg pain from sports injuries. 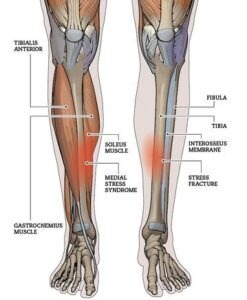 This condition is typically a result of overworking the muscles, tendons, and bone tissue of the legs. For shin splints, as for so many other sports injuries, proper warm-ups and careful avoidance of overexertion can prevent the condition. If shin splints occur, rest, icing, and over-the-counter pain medications are usually sufficient to alleviate the pain.